The Great War Island presents a beautiful green oasis in the city of Belgrade that should not be bypassed during your Belgrade tour. Great War Island is an oasis of untouched nature in the center of Belgrade, which was settled with about a thousand birds from Scandinavia and 180 native species. 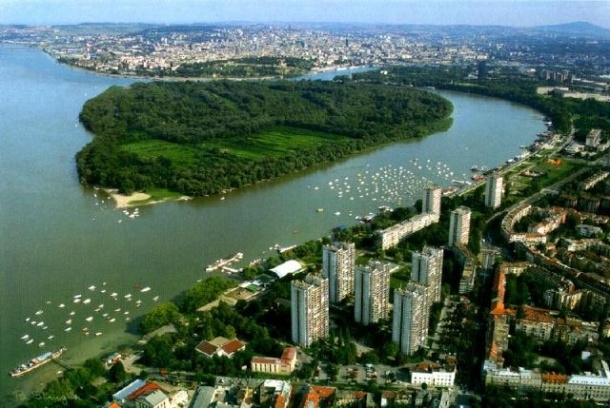 Belgrade is the only European capital, through which the two major rivers are flowing, the Danube and the Sava River. At the confluence of these two rivers, under the Belgrade fortress and Kalemegdan Park, there is the Great War Island, the empire of the intact flora and fauna, which is under the government protection. The island was not always at this location. The experts say that the water emerged three centuries ago in a strange combination of natural factors of the Earth's history, as a result of the merging of the Avala ridge and the Pannonia Plain and with the merging of two rivers into one. Since it was created, the island has changed appearance, size, and even a name. Today’s appearance has remained from the time of the Habsburg Empress Maria Theresa. It is located on the area of 200 acres. A the peak of the Island which enters the Danube River waters is the oval sandbar Lido which is the popular swimming area in Zemun , and a gathering place of many fishermen. The largest part of the island is covered by forests, which in some places almost impassable. In the central part of the island, there is the long pond which remained after the waterfall that existed on the island and was dividing the island into two parts. The meadows on the island are full of medicinal herbs. At the Great War Island more than a hundred species of birds are nesting, including some very rare species. During the winter there are hundreds of cormorants are one of the most endangered bird species in Europe. In the spring time, the island is often flooded and then becomes a haven for fish spawning in shallow water and the fresh springing grass. Though officially uninhabited, almost a dozen of people live in small shacks in the island's interior. They are mostly retirees who move to the island during the warm season and maintain their vegetable gardens, while in the winter they return to Belgrade. The island gained its militant name because throughout the history Great War Island was an important strategic point either for the conquest or the defense of Belgrade. For example, in 1521 when Belgrade was under siege by Turkish forces, the majority of their attacks on Belgrade fortress were launched from the island. In liberating Belgrade in 1806 the rebel army headed by Karadjordje also used the island for military purposes, as the Serbian artillery with 500 soldiers was bombing the Kalemegdan fortress from there. During the offensive in 1915 by Austria-Hungary against Belgrade, Austria-Hungary forces used the island to launch their attacks.